OBJECTIVE OF THE STUDY: Laparoscopic cholecystectomy (LC) remains one of the most frequent surgical therapies for symptomatic gallstone disorders. Although associated with several comorbidities, LC became widely accepted even in the elderly. 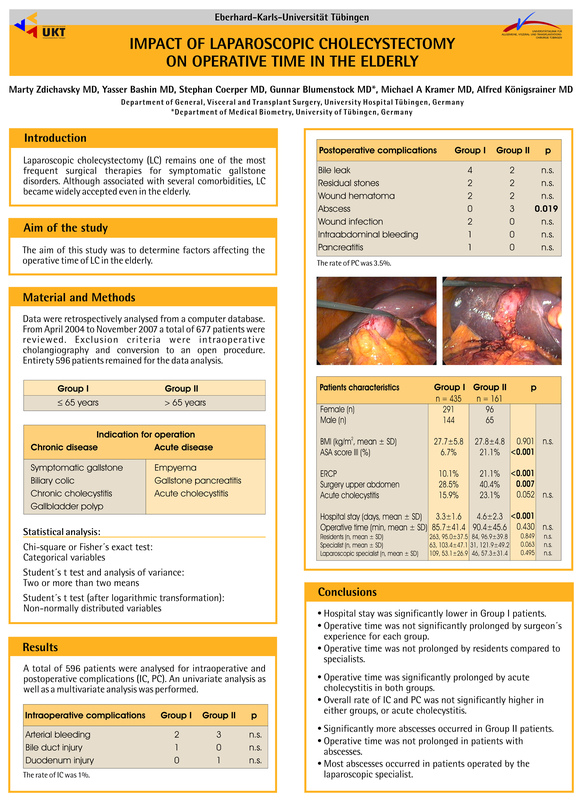 The aim of this study was to determine factors affecting the operative time of LC. METHODS AND PROCEDURES: Patient data were retrospectively analysed from a computer database. From April 2004 to November 2007 a total number of 596 patients were included and divided in two groups (Group I: ≤65 years, Group II >65 years). Indications for LC were benign chronic or acute symptoms of gallbladder disorders. An evaluation sheet was developed for systematic review. Age, gender, BMI, ASA-score, preoperative ERCP, operative indications, and surgeon`s experience were evaluated. Univariate and multivariate statistical analysis was performed. RESULTS: The mean (±SD) age of the 596 patients was 52.2±16.7 years (range, 16-89 years). Median operative time in Group I patients (n = 425) was 80.0 min (range, 57.0-106.5 min) and in Group II patients (n = 171) 80.0 min (range, 56.0-116.5min). Comparing the logarithmic means of the operative time for LC of different age groups, the difference was statistically not significant. Overall, univariate and multivariate analysis showed male gender, obesity, acute cholecystitis, previous upper abdominal surgery and surgeon`s experience to be statistically significant predictors for long operative time for LC. Comparing median operative time for LC performed by laparoscopic and none-laparoscopic specialists, significant shorter operative time was found for the laparoscopic specialist group. Rate of intraoperative complications was 1%. Considering acute cholecystitis only, the rate was 1.9%. Postoperative complication rate was 3.5%, and 5.7% for acute cholecystitis alone. CONCLUSIONS: Operative time for LC was not prolonged in the elderly. But several predictors for prolonged operative time may identify high risk patients requiring additional anesthesia care. Structured training programs, but also patient`s selection should minimize the risk of prolonged surgical intervention and associated complications.